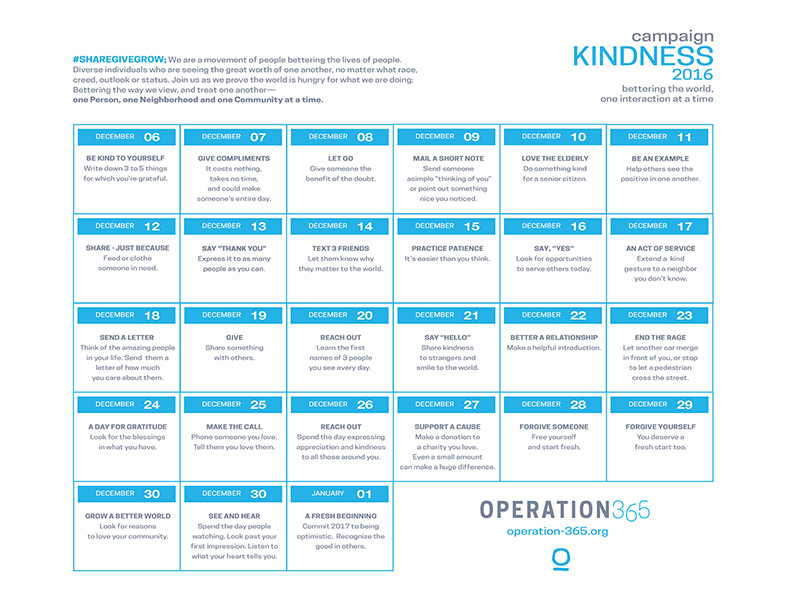 Join us as we dedicate 27 days to sharing acts of kindness and service. Your influence matters, as together, we grow in bettering neighborhoods, communities and the lives of others. It's easy to participate. Just download a calendar and get try out the challenges. The more who sign up, the greater our effect. Part social, part rally, part outreach, Op365 Get Togethers are cornerstone to our grass roots movement. Open to all who are ready to gather in constructive dialogue and action, our dream is that through these events we can assemble many diverse people in a shared purpose, as together, we find ways to better the way we view, and treat, one another. We'll have some great food, music, silent auction and a special presentation from Operation-365 founder Richard Radstone. Bar Celona is waiting... Lets fill the place. We are dedicating the 4th Saturday of every month as a day of compassion. One day to refresh our outlooks as we invite all to take a short break from digital device. To focus toward one another in the face-to-face world. Together, we can show the world we are a powerful majority. A people who value diversity, embrace the power of empathy and believe acts of service are key to bettering the way we view, and treat, one another. Make your influence known. Sign up now and help our counter grow.